Will find with glass in ten times ten. He was born in Concord, Massachusetts, on the 12th of July, 1817. He was graduated at Harvard College in 1837, but without any literary distinction. An iconoclast in literature, he seldom thanked colleges for their service to him, holding them in small esteem, whilst yet his debt to them was important. After leaving the University, he joined his brother in teaching a private school, which he soon renounced. His father was a manufacturer of lead-pencils, and Henry applied himself for a time to this craft, believing he could make a better pencil than was then in use. After completing his experiments, he exhibited his work to chemists and artists in Boston, and having obtained their certificates to its excellence and to its equality with the best London manufacture, he returned home contented. His friends congratulated him that he had now opened his way to fortune. But he replied that he should never make another pencil. “Why should I? I would not do again what I have done once.” He resumed his endless walks and miscellaneous studies, making every day some new acquaintance with Nature, though as yet never speaking of zoology or botany, since, though very studious of natural facts, he was incurious of technical and textual science. Â At this time, a strong, healthy youth, fresh from college, whilst all his companions were choosing their profession, or eager to begin some lucrative employment, it was inevitable that his thoughts should be exercised on the same question, and it required a rare decision to refuse all the accustomed paths and keep his solitary freedom at the cost of disappointing the natural expectations of his family and friends: all the more difficult that he had a perfect probity, was exact in securing his own independence, and in holding every man to the like duty. But Thoreau never faltered. He was a born protestant. He declined to give up his large ambition of knowledge and action for any narrow craft or profession, aiming at a much more comprehensive calling, the art of living well. If he slighted and defied the opinions of others, it was only that he was more intent to reconcile his practice with his own belief. Never idle or self-indulgent, he preferred, when he wanted money, earning it by some piece of manual labor agreeable to him, as building a boat or a fence, planting, grafting, surveying or other short work, to any long engagements. With his hardy habits and few wants, his skill in wood-craft, and his powerful arithmetic, he was very competent to live in any part of the world. It would cost him less to supply his wants than another. He was therefore secure of his leisure. Â A natural skill for mensuration, growing out of his mathematical knowledge and his habit of ascertaining the measures and distances of objects which interested him, the size of trees, the depth and extent of ponds and rivers, the height of mountains and the air-line distance of his favorite summits, this, and his intimate knowledge of the territory about Concord, made him drift into the profession of land-surveyor. It had the advantage for him that it led him continually into new and secluded grounds, and helped his studies of Nature. His accuracy and skill in his work were readily appreciated, and he found all the employment he wanted. Yet, hermit and stoic as he was, he was really fond of sympathy, and threw himself heartily and childlike into the company of young people whom he loved, and whom he delighted to entertain, as he only could, with the varied and endless anecdotes of his experiences by field and river: and he was always ready to lead a huckleberry-party or a search for chestnuts or grapes. Talking, one day, of a public discourse, Henry remarked that whatever succeeded with the audience was bad. I said, “Who would not like to write something which all can read, like ‘Robinson Crusoe?’ and who does not see with regret that his page is not solid with a right materialistic treatment, which delights everybody?” Henry objected, of course, and vaunted the better lectures which reached only a few persons. But, at supper, a young girl, understanding that he was to lecture at the Lyceum, sharply asked him, “Whether his lecture would be a nice, interesting story, such as she wished to hear, or whether it was one of those old philosophical things that she did not care about.” Henry turned to her, and bethought himself, and, I saw, was trying to believe that he had matter that might fit her and her brother, who were to sit up and go to the lecture, if it was a good one for them. He was a speaker and actor of the truth, born such, and was ever running into dramatic situations from this cause. In any circumstance it interested all bystanders to know what part Henry would take, and what he would say; and he did not disappoint expectation, but used an original judgment on each emergency. In 1845 he built himself a small framed house on the shores of Walden Pond, and lived there two years alone, a life of labor and study. This action was quite native and fit for him. No one who knew him would tax him with affectation. He was more unlike his neighbors in his thought than in his action. As soon as he had exhausted the advantages of that solitude, he abandoned it. In 1847, not approving some uses to which the public expenditure was applied, he refused to pay his town tax, and was put in jail. A friend paid the tax for him, and he was released. The like annoyance was threatened the next year. But as his friends paid the tax, notwithstanding his protest, I believe he ceased to resist. No opposition or ridicule had any weight with him. He coldly and fully stated his opinion without affecting to believe that it was the opinion of the company. It was of no consequence if every one present held the opposite opinion. On one occasion he went to the University Library to procure some books. The librarian refused to lend them. Mr. Thoreau repaired to the President, who stated to him the rules and usages, which permitted the loan of books to resident graduates, to clergymen who were alumni, and to some others resident within a circle of ten miles’ radius from the College. Mr. Thoreau explained to the President that the railroad had destroyed the old scale of distances,–that the library was useless, yes, and President and College useless, on the terms of his rules,–that the one benefit he owed to the College was its library,–that, at this moment, not only his want of books was imperative, but he wanted a large number of books, and assured him that he, Thoreau, and not the librarian, was the proper custodian of these. In short, the President found the petitioner so formidable, and the rules getting to look so ridiculous, that he ended by giving him a privilege which in his hands proved unlimited thereafter. But idealist as he was, standing for abolition of slavery, abolition of tariffs, almost for abolition of government, it is needless to say he found himself not only unrepresented in actual politics, but almost equally opposed to every class of reformers. Yet he paid the tribute of his uniform respect to the Anti-Slavery party. One man, whose personal acquaintance he had formed, he honored with exceptional regard. 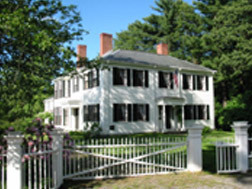 Before the first friendly word had been spoken for Captain John Brown, he sent notices to most houses in Concord that he would speak in a public hall on the condition and character of John Brown, on Sunday evening, and invited all people to come. The Republican Committee, the Abolitionist Committee, sent him word that it was premature and not advisable. He replied, “I did not send to you for advice, but to announce that I am to speak.” The hall was filled at an early hour by people of all parties, and his earnest eulogy of the hero was heard by all respectfully, by many with a sympathy that surprised themselves. It was said of Plotinus that he was ashamed of his body, and ‘t is very likely he had good reason for it, –that his body was a bad servant, and he had not skill in dealing with the material world, as happens often to men of abstract intellect. But Mr. Thoreau was equipped with a most adapted and serviceable body. He was of short stature, firmly built, of light complexion, with strong, serious blue eyes, and a grave aspect, –his face covered in the late years with a becoming beard. His senses were acute, his frame well-knit and hardy, his hands strong and skilful in the use of tools. And there was a wonderful fitness of body and mind. He could pace sixteen rods more accurately than another man could measure them with rod and chain. He could find his path in the woods at night, he said, better by his feet than his eyes. He could estimate the measure of a tree very well by his eye; he could estimate the weight of a calf or a pig, like a dealer. From a box containing a bushel or more of loose pencils, he could take up with his hands fast enough just a dozen pencils at every grasp. He was a good swimmer, runner, skater, boatman, and would probably outwalk most countrymen in a day’s journey. And the relation of body to mind was still finer than we have indicated. He said he wanted every stride his legs made. The length of his walk uniformly made the length of his writing. If shut up in the house he did not write at all. He has a strong common sense, like that which Rose Flammock, the weaver’s daughter in Scott’s romance, commends in her father, as resembling a yardstick, which, whilst it measures dowlas and diaper, can equally well measure tapestry and cloth of gold. He had always a new resource. When I was planting forest trees, and had procured half a peck of acorns, he said that only a small portion of them would be sound, and proceeded to examine them and select the sound ones. But finding this took time, he said, “I think if you put them all into water the good ones will sink;” which experiment we tried with success. He could plan a garden or a house or a barn; would have been competent to lead a “Pacific Exploring Expedition;” could give judicious counsel in the gravest private or public affairs. He lived for the day, not cumbered and mortified by his memory. If he brought you yesterday a new proposition, he would bring you to-day another not less revolutionary. A very industrious man, and setting, like all highly organized men, a high value on his time, he seemed the only man of leisure in town, always ready for any excursion that promised well, or for conversation prolonged into late hours. His trenchant sense was never stopped by his rules of daily prudence, but was always up to the new occasion. He liked and used the simplest food, yet, when some one urged a vegetable diet, Thoreau thought all diets a very small matter, saying that “the man who shoots the buffalo lives better than the man who boards at the Graham House.” He said, “You can sleep near the railroad, and never be disturbed: Nature knows very well what sounds are worth attending to, and has made up her mind not to hear the railroad-whistle. But things respect the devout mind, and a mental ecstasy was never interrupted.” He noted what repeatedly befell him, that, after receiving from a distance a rare plant, he would presently find the same in his own haunts. And those pieces of luck which happen only to good players happened to him. One day, walking with a stranger, who inquired where Indian arrowheads could be found, he replied, “Everywhere,” and, stooping forward, picked one on the instant from the ground. At Mount Washington, in Tuckerman’s Ravine, Thoreau had a bad fall, and sprained his foot. As he was in the act of getting up from his fall, he saw for the first time the leaves of the Arnica mollis. His robust common sense, armed with stout hands, keen perceptions and strong will, cannot yet account for the superiority which shone in his simple and hidden life. I must add the cardinal fact, that there was an excellent wisdom in him, proper to a rare class of men, which showed him the material world as a means and symbol. This discovery, which sometimes yields to poets a certain casual and interrupted light, serving for the ornament of their writing, was in him an unsleeping insight; and whatever faults or obstructions of temperament might cloud it, he was not disobedient to the heavenly vision. In his youth, he said, one day, “The other world is all my art; my pencils will draw no other; my jack-knife will cut nothing else; I do not use it as a means.” This was the muse and genius that ruled his opinions, conversation, studies, work and course of life. This made him a searching judge of men. At first glance he measured his companion, and, though insensible to some fine traits of culture, could very well report his weight and caliber. And this made the impression of genius which his conversation sometimes gave. He understood the matter in hand at a glance, and saw the limitations and poverty of those he talked with, so that nothing seemed concealed from such terrible eyes. I have repeatedly known young men of sensibility converted in a moment to the belief that this was the man they were in search of, the man of men, who could tell them all they should do. His own dealing with them was never affectionate, but superior, didactic, scorning their petty ways, –very slowly conceding, or not conceding at all, the promise of his society at their houses, or even at his own. “Would he not walk with them?” “He did not know. There was nothing so important to him as his walk; he had no walks to throw away on company.” Visits were offered him from respectful parties, but he declined them. Admiring friends offered to carry him at their own cost to the Yellowstone River,–to the West Indies,–to South America. But though nothing could be more grave or considered than his refusals, they remind one, in quite new relations, of that fop Brummel’s reply to the gentleman who offered him his carriage in a shower, “But where will you ride, then?”–and what accusing silences, and what searching and irresistible speeches, battering down all defences, his companions can remember! Mr. Thoreau dedicated his genius with such entire love to the fields, hills and waters of his native town, that he made them known and interesting to all reading Americans, and to people over the sea. The river on whose banks he was born and died he knew from its springs to its confluence with the Merrimack. He had made summer and winter observations on it for many years, and at every hour of the day and night. The result of the recent survey of the Water Commissioners appointed by the State of Massachusetts he had reached by his private experiments, several years earlier. Every fact which occurs in the bed, on the banks or in the air over it; the fishes, and their spawning and nests, their manners, their food; the shad-flies which fill the air on a certain evening once a year, and which are snapped at by the fishes so ravenously that many of these die of repletion; the conical heaps of small stones on the river-shallows, the huge nests of small fishes, one of which will sometimes overfill a cart; the birds which frequent the stream, heron, duck, sheldrake, loon, osprey; the snake, muskrat, otter, woodchuck and fox, on the banks; the turtle, frog, hyla and cricket, which make the banks vocal, were all known to him, and, as it were, townsmen and fellow creatures; so that he felt an absurdity or violence in any narrative of one of these by itself apart, and still more of its dimensions on an inch-rule, or in the exhibition of its skeleton, or the specimen of a squirrel or a bird in brandy. He liked to speak of the manners of the river, as itself a lawful creature, yet with exactness, and always to an observed fact. As he knew the river, so the ponds in this region. His interest in the flower or the bird lay very deep in his mind, was connected with Nature, and the meaning of Nature was never attempted to be defined by him. He would not offer a memoir of his observations to the Natural History Society. “Why should I? To detach the description from its connections in my mind would make it no longer true or valuable to me: and they do not wish what belongs to it.” His power of observation seemed to indicate additional senses. He saw as with a microscope, heard as with ear-trumpet, and his memory was a photographic register of all he saw and heard. And yet none knew better than he that it is not the fact that imports, but the impression or effect of the fact on your mind. Every fact lay in glory in his mind, a type of the order and beauty of the whole. His determination on Natural History was organic. He confessed that he sometimes felt like a hound or a panther, and, if born among Indians, would have been a fell hunter. But, restrained by his Massachusetts culture, he played out the game in this mild form of botany and ichthyology. His intimacy with animals suggested what Thomas Fuller records of Butler the apiologist, that “either he had told the bees things or the bees had told him.” Snakes coiled round his legs; the fishes swam into his hand, and he took them out of the water; he pulled the woodchuck out of its hole by the tail, and took the foxes under his protection from the hunters. Our naturalist had perfect magnanimity; he had no secrets: he would carry you to the heron’s haunt, or even to his most prized botanical swamp, possibly knowing that you could never find it again, yet willing to take his risks. No college ever offered him a diploma, or a professor’s chair; no academy made him its corresponding secretary, its discoverer or even its member. Perhaps these learned bodies feared the satire of his presence. Yet so much knowledge of Nature’s secret and genius few others possessed; none in a more large and religious synthesis. For not a particle of respect had he to the opinions of any man or body of men, but homage solely to the truth itself; and as he discovered everywhere among doctors some leaning of courtesy, it discredited them. He grew to be revered and admired by his townsmen, who had at first known him only as an oddity. The farmers who employed him as a surveyor soon discovered his rare accuracy and skill, his knowledge of their lands, of trees, of birds, of Indian remains and the like, which enabled him to tell every farmer more than he knew before of his own farm; so that he began to feel a little as if Mr. Thoreau had better rights in his land than he. They felt, too, the superiority of character which addressed all men with a native authority. Indian relics abound in Concord, arrow-heads, stone chisels, pestles and fragments of pottery; and on the river-bank, large heaps of clam-shells and ashes mark spots which the savages frequented. These, and every circumstance touching the Indian, were important in his eyes. His visits to Maine were chiefly for love of the Indian. He had the satisfaction of seeing the manufacture of the bark canoe, as well as of trying his hand in its management on the rapids. He was inquisitive about the making of the stone arrow-head, and in his last days charged a youth setting out for the Rocky Mountains to find an Indian who could tell him that: “It was well worth a visit to California to learn it.” Occasionally, a small party of Penobscot Indians would visit Concord, and pitch their tents for a few weeks in summer on the river-bank. He failed not to make acquaintance with the best of them; though he well knew that asking questions of Indians is like catechizing beavers and rabbits. In his last visit to Maine he had great satisfaction from Joseph Polis, an intelligent Indian of Oldtown, who was his guide for some weeks. His virtues, of course, sometimes ran into extremes. It was easy to trace to the inexorable demand on all for exact truth that austerity which made this willing hermit more solitary even than he wished. Himself of a perfect probity, he required not less of others. He had a disgust at crime, and no worldly success could cover it. He detected paltering as readily in dignified and prosperous persons as in beggars, and with equal scorn. Such dangerous frankness was in his dealing that his admirers called him “that terrible Thoreau,” as if he spoke when silent, and was still present when he had departed. I think the severity of his ideal interfered to deprive him of a healthy sufficiency of human society. There is a flower known to botanists, one of the same genus with our summer plant called “Life-Everlasting,” a Gnaphalium like that, which grows on the most inaccessible cliffs of the Tyrolese mountains, where the chamois dare hardly venture, and which the hunter, tempted by its beauty, and by his love (for it is immensely valued by the Swiss maidens), climbs the cliffs to gather, and is sometimes found dead at the foot, with the flower in his hand. It is called by botanists the Gnaphalium leontopodium, but by the Swiss Edelweiss, which signifies Noble Purity. Thoreau seemed to me living in the hope to gather this plant, which belonged to him of right. The scale on which his studies proceeded was so large as to require longevity, and we were the less prepared for his sudden disappearance. The country knows not yet, or in the least part, how great a son it has lost. It seems an injury that he should leave in the midst of his broken task which none else can finish, a kind of indignity to so noble a soul that he should depart out of Nature before yet he has been really shown to his peers for what he is. But he, at least, is content. His soul was made for the noblest society; he had in a short life exhausted the capabilities of this world; wherever there is knowledge, wherever there is virtue, wherever there is beauty, he will find a home.